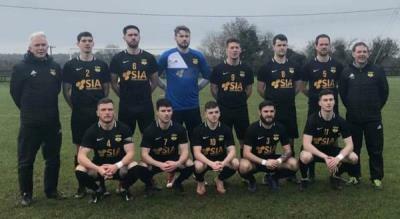 Glengad reached the FAI Junior Cup quarter finals with a 3-1 win at Crettyard in Carlow. Glengad United completed four premier division titles in a row. 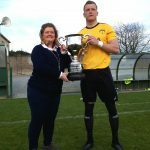 Glengad regained the Clubmans Shirts league cup with a comprehensive victory over a gallant Redcastle side. Redcastle set their stall out to frustrate the league champions and it was working well until the last minute of the first half. 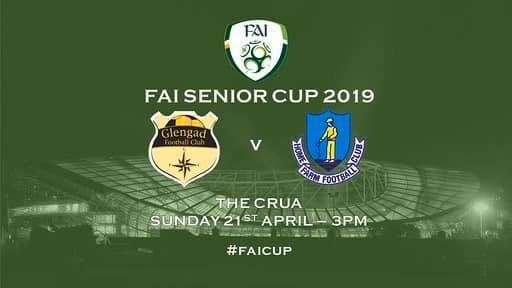 Glengad had the first chance on 3 minutes when a superb Shane Canning pass out to Stephen McLaughlin on the right saw the winger cut inside and unleash an effort which Michael McCole held well. They had a great chance on 10 minutes after great work by Terence Doherty on the left saw him cut along the byeline and fed the ball back to McLaughlin but his effort was deflected wide by a defender. Long range efforts from Adam Byrne and McLaughlin were both easily gathered by McCole. Just as it looked like being scoreless at the break Glengad struck. A long hooked clearance by James McKinney sent Terence Doherty clear and he headed over the advancing McCole from sixteen yards. Glengad started the second half well and increased their lead two minutes in when Seamus Doherty’s free broke to a Redcastle defender but a poor clearance fell to Terence Doherty who fired inside the near post from the edge of the area. Redcastle replied and a Denim McLaughlin through ball found Aaron Nash who got in front of a defender but failed to control.At the other end John G McLaughlin headed over from a corner before Redcastle’s Conor McNamee and Shaun Curran both fired over the bar from twenty yards. Glengad then had two great chances to seal the game when both Michael Byrne and substitute Christopher McLaughlin raced clean through but McCole made superb saves on both occasions. On 77 minutes Canning released Terence Doherty but McCole blocked with his legs and the loose ball fell to Michael Byrne who rolled it wide of the gaping goal from twenty yards. Redcastle replied with substitute Darragh McConway firing wide before the same player delivered a superb cross from the right but Jack McConalogue headed over the bar. Another fine ball over the top released Terence Doherty but McCole excelled again denying the striker his hat trick. But Doherty was not to be denied on the stroke of full time when Stephen McLaughlin fed Doherty who rounded McCole checked back and fired a sweet left footed effort to the net from fifteen yards. 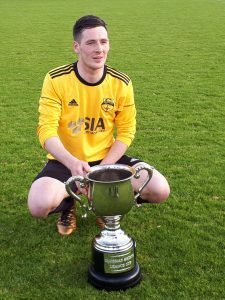 To rub salt into the wounds Glengad added a superb fourth in injury time after Christopher McLaughlin played a superb one two with brother Stephen before rifling a brilliant powerful effort past McCole. As usual there were players on both sides who performed well. For the losers Michael McCole was excellent while Dean Curran and Denim McLaughlin tried hard. For the winners Stephen McLaughlin , Shane Canning and Adam Byrne were excellent but the award goes to Terence Doherty who scored a tremendous hat trick and whose link u play was of the highest order.